Most of the fanfare in our Fall 2014 catalog is about new equipment and heat transfer materials. But we’ve added some nifty shop tools too. As anyone who’s worked in a busy sign shop knows, having the right finishing and application tools can be almost as important as having the right equipment. Well-designed vinyl application tools can increase efficiency and reduce costly errors. And a cleverly designed tool is just plain fun. Anything that makes work more enjoyable is a good thing. With that in mind, consider these innovative new vinyl application tools for your sign shop or vinyl graphics business. We first saw the Alumalite Squeegee at the 2014 ISA Expo. The Image One Impact folks were demonstrating it by applying vinyl over coroplast sign blanks with no application fluid and no bubbles. The process took only a few minutes and resulted in nearly perfect mounting of the vinyl that looked quite slick. The genius is in the design of the Alumalite Squeegee. You simply peel off the leading edge of liner, tack it to the sign blank, and push the tool forward. It peels the vinyl off the liner and mounts it to the blank in one smooth motion. It’s really more of a mounting tool than a squeegee and performs similar to the Big Squeegee product line. So is it a totally unique solution? No, but it’s quite good. It has a ‘sooper-glide’ felt edge that prevents scratching the vinyl or substrate. In addition to mounting prints on rigid substrates, the Alumalite can be used to install graphics on windows, banners, vehicles and other large substrates. It’s well designed, and built from solid materials that give you the confidence that it will be in use for years to come. The Alumalite Squeegee come in six convenient widths: 8″, 14″, 20″, 26″, 38″ and 50″. So you can use it on everything from bumper stickers to banners. Prices start at $64.00. If you’d like to start with an assortment for different applications, consider the Value Five-Pack. It bundles 8″, 14″, 20″, 26″, and 38″ squeegees into one package and saves you a cool $31.00. Vehicle Wrap Stud Bar Magnets are recommended by Justin Pate and offer some surprising benefits. The explosion in demand for custom vehicle wraps and paint replacement has generated lots of interest in tools that make complex vehicle graphics installations a little easier. The right tool can reduce installation time and or enhance quality. Installers have been using magnets for a few years now. The new Vehicle Wrap Stud Bar Magnets offer amazing holding power and clever new features. The idea behind vehicle wrap magnets of course is to provide an extra ‘hand’ to hold vinyl panels in place during installation. The bar shape effectively gives you a larger ‘hand’ to anchor your panels. And, with 25lbs of pull force, it’s a strong hand that won’t let panels slip and slide. They’re recommended by expert wrap trainer and installer Justin Pate. A non-scratch felt liner is included to protect paint and prints. And they come with a clever magnetic shield that blocks magnetism during storage. So you don’t have to waste time prying your other tools of off them when you pull them out of the tool bag. They come in red, purple and orange. A six-pack of these revolutionary super-strong magnets is yours for only $36.00. Click here to order. Okay, so we’ve got cool new squeegees and cool new magnets. What could be better? How about a magnetic squeegee? This has to be one of the most ingenious vehicle wrap devices ever made. It’s one of those things that makes you slap your forehead and say, ‘Why didn’t I think of that?’ The magnetic squeegee is designed like most other squeegees, with a strong, but flexible edge for applying vinyl graphics. But it’s got a powerful magnet inside. So you can also use it to hold panels in place. Then, when you have the panel positioned and ready to apply, simply remove the magnet and use it to squeegee the panel onto the vehicle. Like all good wrap tools, it’s brightly colored so it stands out even on busy backgrounds. The magnetic squeegee has one more neat trick. 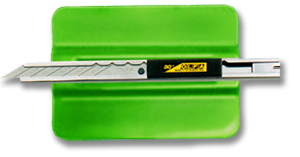 It has an indentation perfectly fitted for holding your OLFA SVR-1 or other cutting knife. The magnetic element not only holds your panels on the vehicle, but it holds your knife until you’re ready to trim the edges. 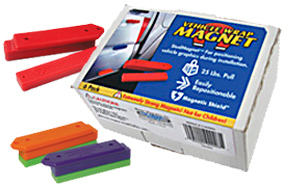 It’s hard to imagine a more versatile or ingenious vehicle wrap tool than the magnetic squeegee. If you can’t imagine living without one, click here to order. They’re only $10.45. The Pro Roll Tape Applicators are durable and easy to use. Anyone working with cut vinyl knows the importance of proper transfer tape application. Few things are more frustrating than weeding a complex vinyl graphic only to have it ruined by wrinkled transfer tape. Smooth transfer tape application is key to efficiency. One of the best ways to solve this problem is with a Pro-Roll Tape Applicator. Going from hand application with a squeegee to a tape application tool will produce more accurate alignment of tape to vinyl, and fewer botched applications. That means fewer frustrating re-cuts. Almost all sign industry tape tools also allow you to pre-mask large jobs with speed and confidence. The Pro-Roll isn’t the first of its kind, but it is designed to solve problems associated with other tools on the market. The sturdy aluminum unibody frame construction and aluminum shafts allow you to apply more force without worrying about causing wrinkles in the tape. Besides being rugged, it’s easy to use. Tape rolls can be mounted or changed in seconds. The Pro-Roll comes in three sizes, 12″, 24″, and 36″ widths. The 12″ Pro-Roll handles 3″ – 12″ rolls of tape. The 24″model accommodates 12″ to 24″ wide rolls, and the 36″ Pro-Roll handles rolls from two to three feet wide. Prices start at $146.85. Click here to order. If you’re looking for a way to speed up production of your pre-masking vinyl signs, increase efficiency in your wrap installations, or mount prints to substrates more effectively, one or more of these great new devices may be just what you need.